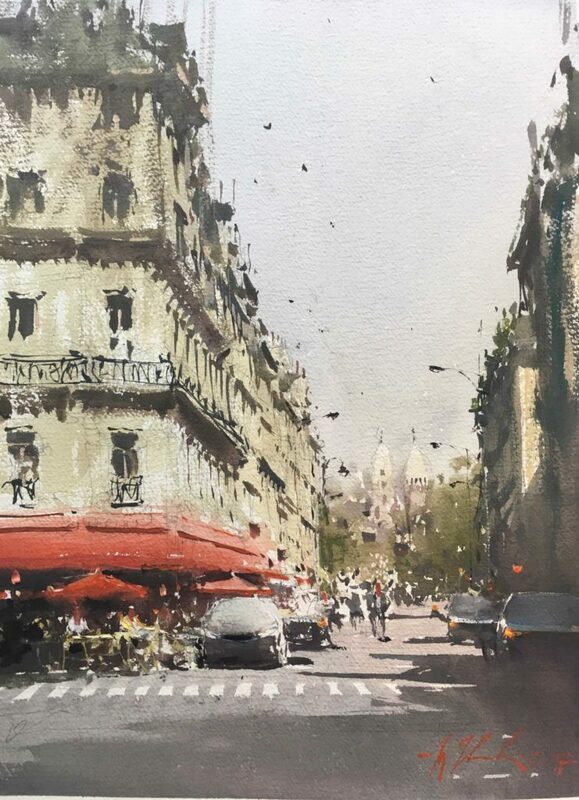 Please help us welcome watercolor artist Joseph Zbukvic as a newly announced faculty member for the 8th Annual Plein Air Convention & Expo (April 2019, San Francisco, California). Master watercolorist Joseph Zbukvic was born in Zagreb, Croatia. His early education was very diverse, including both the performing and visual arts. Despite his obvious talent for painting, in 1967 he enrolled in university to study languages and literature in order to pursue a teaching career. That path was interrupted in 1970, when, due to political unrest, he decided to emigrate to Australia. There he saw an opportunity to return to art and continued his formal education at Deakin University, Melbourne. He graduated in 1974 with a degree in art, majoring in industrial design. During this time he began to paint again, achieving instant success at art competitions and winning his first major art award, in 1975 (Corio Council Art Award, judged by Richard Heffernan, head of Deakin’s art faculty). In 1978 he took up painting full-time, quickly establishing himself as one of the leading artists in Australia. To date he has had over 40 solo exhibitions in Melbourne, Sydney, Brisbane, and Adelaide, as well as in London and in San Antonio, Texas. He is a member of the Victorian Watercolour Society and served as its vice president from 1991 to 1994, and he was invited to join the Australian Guild of Realist Artists in 1988. Zbukvic has been a member of the Victorian Artists Society since 1988, and a teacher at Charles Sturt University, Mitchell School of Arts. He is also a long-serving member of the Twenty Melbourne Painters Society. In 1998 he was nominated and accepted for membership in the esteemed Australian Watercolour Institute. He has won more than 200 awards in his career, including the coveted Gold Medal for best painting at the Camberwell Rotary Art Exhibition — three times. That panel of judges was chaired by Richard Stone, portrait painter for the royal family. Joseph Zbukvic is considered one of the best watercolor artists in the world, and after eight years of trying to sign him up for PACE, we have finally succeeded! Meet Zbukvic and other outstanding demo artists on the faculty at PACE. To me, Joseph is the undisputed master of Watercolour. There are many artists that work in that medium that are good and even great, but his ability to show light and atmosphere is the finest I’ve ever seen. The 3rd painting you showed of the boats on the canal is a clear example of what he can do.